The father of “Mob Wives” star Renee Graziano was indicted today on extortion conspiracy charges. 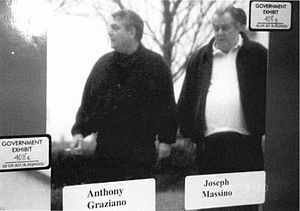 Brooklyn federal prosecutors say former Bonanno crime family consigliere Anthony “T.G” Graziano conspired to collect a $100,000 debt with the aid of several other mobsters. Graziano, 71, now a Bonanno captain, was released recently from prison but was quickly ensnared in a probe by Drug Enforcement Administration agents. Renee Graziano’s ex-husband, Hector Pagan - a Bonanno associate-turned DEA informant - reportedly wore a wire and secretly recorded conversations for the feds with his ex-father-in-law while discussing the collection of a loanshark debt.